The official website of Dinagyang Festival in Iloilo announced early January 2014 the schedule of events or activities for the grand celebration of the annual Dinagyang. Highlights of event is set on January 24-26, 2014. January, 24 (Friday) at 8:00AM – Tambor Trumpa Martsa Musika from Bonifacio Drive to Freedom Grandstand4 January 24, 2014 (Friday) at 3:00PM – Religious Fluvial and Solemn Foot Procession of the image of Santo Niño de Cebu. From Fort San Pedro to Iloilo Customs House, followed by solemn foot procession to San Jose de Placer Church. January 25, (Saturday) at 8:00AM – Kasadyahan Regional Festival along the Street Parade Route. Dinagyang is Iloilo City’s version of the Ati-Atihan festival widely celebrated not only in Panay Island but also in other parts of the country. It may not be as ancient as the one in Kalibo in Aklan Province, but is definitely impressive in choreography and striking in terms of the various attires worn by participating tribes which reflect the ingenuity, craftsmanship and artistry of the Ilonggos. “Dinagyang” is an Ilonggo word for revelry or merrymaking coined in 1977 by Ilonggo writer/broadcaster Pacifico Sudario to describe the riotous celebration. 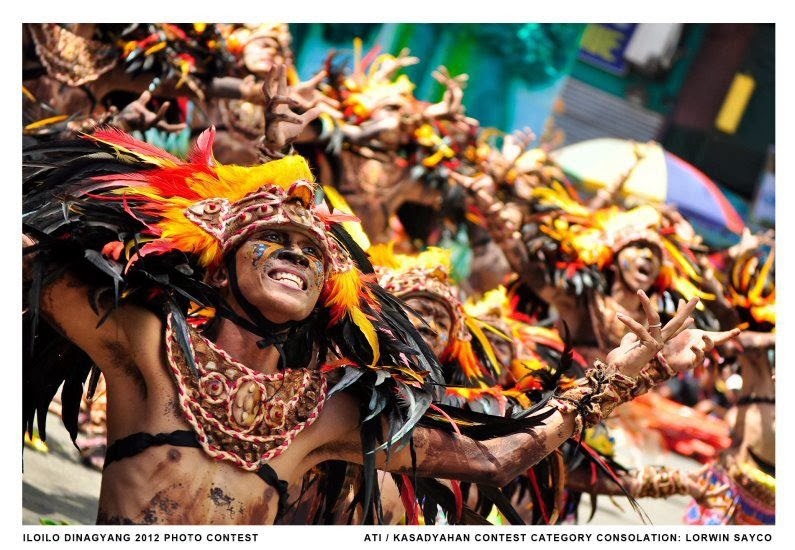 Prior to this, Dinagyang was labeled “Iloilo Ati-Atihan” to differentiate it from other Ati-Atihan festivals. In 1967, a replica of the Santo Niño statue in Cebu was brought to Iloilo as a gift to the Parish of San Jose in Iloilo City. Devotees welcomed the image with a parade through the major streets of the city. This first parade, then confined to the parish, evolved to become the Dinagyang Festival. The task of organizing it now belongs to the city instead of to the parish. The Kasadyahan street dance parade is Dinagyang’s unique feature, celebrated on the Saturday before the Ati-Ati street dancing contest. It is the Ilonggos’ way of thanking God for the bountiful harvest, with performances by tribes from all over Panay who try to best each other in costume, choreography and energy. To learn more about Dinagyang Festival 2014, visit their official website.